Low background alpha/beta radiometer with silicon detector. The radiometer is widely used for low level activity measurements by alpha and beta counting. It is recommended for measurement of gross alpha and beta activity in natural and drinking waters. The MSI / ALT MATRIX Console is a very versatile uphole electronics package designed to work and integrate with the MSI MX Series of winches with capacities from 500 - 1000 meters of standard single-conductor wirelines. This console can be used with Mount Sopris 4WNA series winches and winches made by other vendors. The most popular Mount Sopris winch system can be configured with several types of logging cable. 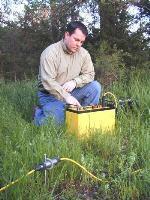 The standard 4MXA-1000 systems includes 500 metes (1640 ft) 0f 3.17 mm (0.125') single-conductor geophysical wireline. This winch will also hold 800 meters (2625 ft) of 2.54 mm (0.10") wireline. 4MXB-1000 winches are designed to handle up to 305 meters (1000 ft) of standard 3.76 mm (0.1875') single-conductor, 4-conductor, or coaxial cable. The 4MXB-1000 winch will also hole 250 mm of 6.35 mm (0.25") coax or 7-conductor cable. 4MXC-1000 winches hold up to 1000 meters (3281 ft) of rugged 3.17 mm single-conductor cable.